In our three-part Race Conscious Readers series this fall, families came together to find ways to talk about race with kids in early elementary school. 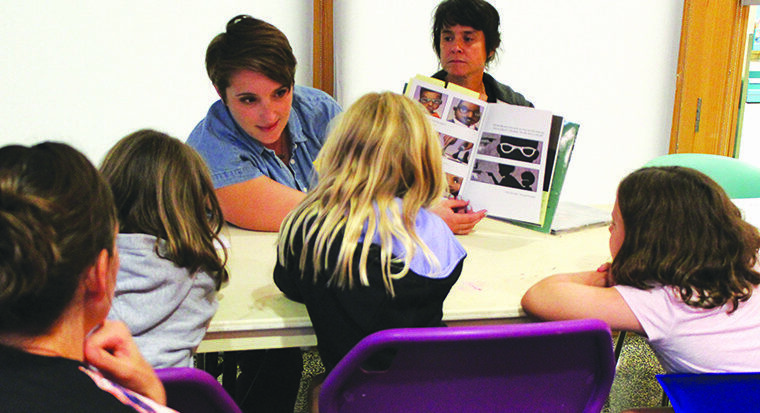 The workshops were aimed especially at families and caregivers who are white. We shared strategies for moving away from “colorblind” parenting, using books that celebrate, empower, and speak truth. Yet while more children’s books about people of color are being published, the number being authored by people of color is still relatively very low, notes multicultural book publisher Lee & Low. In October’s session, we highlighted the #OwnVoices movement, which calls for more authors from marginalized communities to tell their own stories. One book we shared was Fall in Line, Holden!, which author Daniel Vandever wrote based on his experiences attending Western schools and growing up in the Navajo Nation. In November, families talked about taking the tools from the series out into the world. Priddy and other librarians curated apps, websites, podcasts, and more for different age groups that “stretch kids, are inclusive, and can open windows into the lives of others around the world,” she said.